Sorry that my post is late. I just have a lot going on and being sick is not helping. I'm sure it's not helping that it's this is such a busy time of year. Anyhow, here's a tag I made using the adorable Oven Stamp from QKD. The tag is made with Nesties Lable One. The vellum on the top has snowflakes on it but you can't see it in the picture. I hand wrote the sentiment since I wanted it to be personal. The ribbon is just from Michael's. The cookies are yummy yummy molasses cookies. YAY! Hope you all are having a great day! Very cute tag and those cookies look delicious! Try to take it easy girl! Wishing you a quick recovery! So cute! What a great idea! Man those cookies look yummy too! Get back to takin care of yourself. YUM!!!!!!!!!!! Now go get some rest before I have to fly out to CA to take care of you! 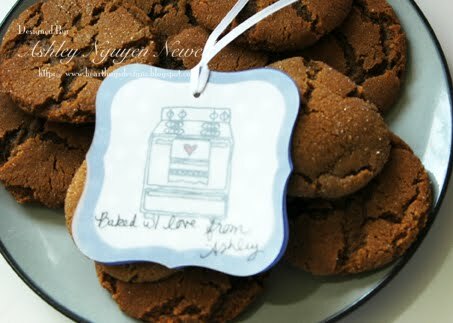 Ooh, not sure which is more enticing, Ash - the tag or the cookies! Cool! cute idea! yummy looking cookies! sooooooooooo cute!!! what an awesome gift!